Stop avoiding turkey burgers. They aren’t all created equal and I want to show you how to make perfect moist turkey burgers to grill this summer! Since nothing says summer with friends and family quite like busting out the grill and sharing delicious food, here’s a fantastic meal that will will over everyone at your table (including the gluten-eaters). This twist on the traditional burger is one that you’ll make many times overs because they’re easy, delicious and moist. Garlic, onion, and parsley cooked within the patty create a burst of juicy flavor in each bite. Top your burger with grilled pineapple salsa and a side of grilled sweet potato wedges and you’ll realize you’ve hit upon summer grilling perfection. These burgers are so good that there’s no need to ruin it with a bun! Plus you don’t need to dose your burger in condiments with hidden high fructose corn syrup and other sugars just to give it some flavor. 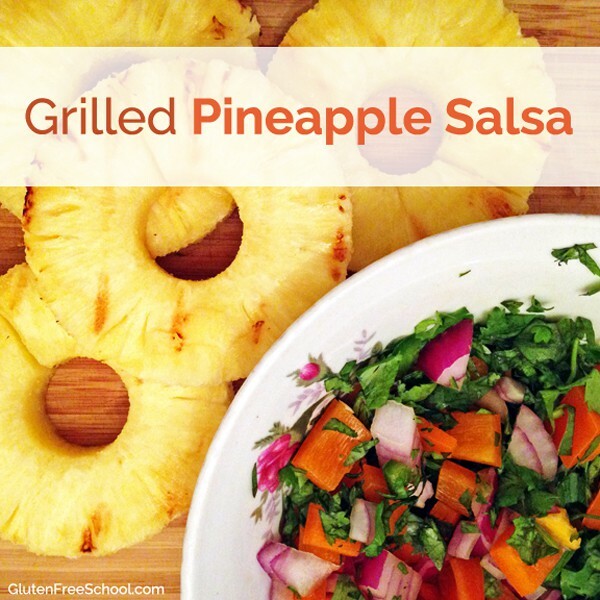 If you’ve never grilled pineapple before, it’s quite simple. Grilling pineapple gives a smoky flavor and brings out the natural sweetness, which works perfectly with spicy jalapeño in a salsa. Some other recipes might call for marinating the pineapple before cooking it which is all well and good, but the natural flavor of the pineapple is enhanced even more by forgoing the marinades and just sizzling it straight on the grill until it’s got those classic grill marks. The reason (aside from overcooking) most of your turkey burgers are dry is because you’re using the wrong meat. While I understand why so many gravitate toward buying ground turkey breast to make burgers and other recipes, the result is relatively tasteless (unless you spice it quite a lot) and dry ground meat. Instead, opt for ground dark meat (which may just be marked as “ground turkey”, but check with the meat counter manager). Plus you’ll save nearly half off because dark meat is typically much less expensive than the premium placed on white meat. This is just one of the many cost-saving tips that you can find in the Savvy Gluten-Free Shopper! If you’re partial to white meat, I promise you won’t know the difference. Every person who has tried these burgers had no idea they were made with the dark meat. Over-grilling meats or cooking meat over very high heat can cause carcinogenic compounds to form called heterocyclic amines (HCAs) and polycyclic aromatic hydrocarbons (PAHs). According to Cancer.gov, HCAs are formed when amino acids (the building blocks of proteins), sugars, and creatine (a substance found in muscle) react at high temperatures. PAHs are formed when fat and juices from meat grilled drip onto the fire beneath it causing elevated flames. To avoid this, don’t cook meat over high heat. Instead, grill your meat over medium heat for a longer period of time. Plus you’ll allow the juices to stay within the burger and avoid burning your meal. Don’t forget to check out our best gluten free recipes for a summer picnic featuring 30 more delicious gluten-free recipes and also see how to grill without getting glutened (a big issue) right here! Summer grilling recipes are at their best with gluten free grilled turkey burgers, grilled pineapple salsa, and grilled sweet potato wedges. Combine all ingredients in a bowl. Make 4 patties. Over a hot grill, heat until thoroughly and evenly cooked. Make sure each patty is fully cooked to the center and there is no pink. Remove from grill and serve immediately. Over a hot grill, heat pineapple slices for approximately 2 to 3 minutes on each side or until visible grill marks are present. Remove from grill. Roughly chop grilled pineapple. Chop other ingredients by hand for a chunkier salsa or use a food processor to combine all ingredients and pulse lightly until well combined. For a less chunky salsa, process more until desired consistency is achieved. Serve over grilled turkey burgers or as a dip. In a microwave, heat 2 small sweet potatoes until partially cooked. Depending on the size, this could take between 7-10 minutes. This speeds up the cooking process on the grill. Remove the sweet potatoes and slice in halves or quarters, length wise. Brush lightly with melted coconut oil. Over a hot grill, heat sweet potato wedges until cooked through. Remove and serve immediately.